5-MTN is the abbreviation for a chemical compound with the name 5-(methylthio)ninhydrin (for the chemical structure see this pop-up window). Just like regular ninhydrin, it will develop purple fingerprints when used on paper. 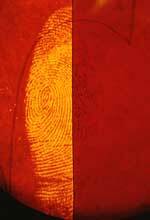 The color of the fingerprints developed with 5-MTN is stronger than the color obtained with regular ninhydrin. Therefore, the concentration of 5-MTN in a working solution can be lower than that of a standard ninhydrin working solution (3 gram per liter, instead of 5 g/l) to still get the same color. Why use 5-MTN instead of ninhydrin? 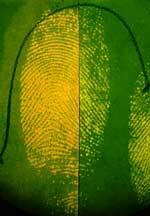 Fingerprints that are developed with 5-MTN become strongly fluorescent after treatment with a zinc chloride solution. The strongly purple colored compound, that is formed when ninhydrin reacts with amino acids or proteins (Ruhemann's purple, see this pop-up window) can complex with a large number of metal ions, like those of nickel, copper, cadmium, and zinc. Usually, this complexation brings about a color change. With regular ninhydrin the color of the developed fingerprints, after treatment with zinc, changes from purple to orange. With 5-MTN developed prints, a red-purple color is obtained after treatment with zinc. This zinc complex fluoresces strongly under green light. Its fluorescence is comparable and in many cases even better, than the fluorescence that is obtained with DFO. 5-MTN combines a good visibility and strong fluorescence. Therefore, hardly visible fingerprints can still be identified. The photographs on the right show a fingerprint on paper. The left half is treated with 5-MTN; the right half with regular ninhydrin. The print is rather weak and the ridges are not well discernible (top picture). After treatment with zinc however, the half developed with 5-MTN and now fluorescing is perfectly identifiable. 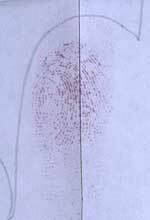 A fingerprint, developed with regular ninhydrin can fluoresce, in principle, after treatment with a cadmium (very poisonous) or zinc salt (for the chemical structure of the complex of Ruhemann's purple with zinc, see this pop-up window). In practice however, it has been found that this procedure is unreliable. The fluorescence appears to be strongly dependent on the conditions used to develop the prints and other, unknown factors. Also, the fluorescence at room temperature is weak. The paper with the prints need to be cooled in liquid nitrogen (temperature of -196 °C) to obtain a reasonable fluorescence. For more information see the article of Wainwright et al. and references cited therein . The fluorescence is very reliable, even when the paper has been subjected to dry heat to develop the fingerprints. Of course this is a procedure that is not advisable: prints developed in this way will have a weaker color than prints developed under ideal circumstances: at room temperature and high air humidity (around 80%). The fluorescence at room temperature is excellent. Though 5-MTN is not as soluble in apolar solvents as ninhydrin, it is much better soluble than DFO. 5-MTN in its ninhydrin form dissolves quite slowly when making the concentrated solution for the working solution described below. We found that the hemiketal of 5-MTN with ethanol (see this pop-up window to see the chemical structure and the interrelation between the triketone, hydrate and hemiketal of 5-MTN) dissolves much faster than 5-MTN (ninhydrin) itself. Therefore, we supply 5-MTN as its hemiketal with ethanol. For a discussion of ninhydrin and its hemiketals see the dissertation of Dr. Olga Petrovskaia (who worked in Prof. Joullié's group) and references cited therein . Fingerprint cut in half and treated with 5-MTN (left) and DFO (right), in daylight. As above, but viewed under green light, through a dark orange filter (MIC). The hemiketal, when applied to paper, will quickly react to the hydrate (the common form of a "ninhydrin") due to water present in the paper and in the atmosphere. The reaction between the amino acids in the fingerprint is therefore not adversely affected by using the hemiketal instead of the ninhydrin. This working solution is stable for extended periods at room temperature. When the solution is kept at low temperatures (for example during shipping in winter time) some 5-MTN might partially crystallize from the solution. After warming to room temperature and stirring or shaking however, the 5-MTN will gradually dissolve again. When preparing the working solution from 5-MTN hemiketal, first dissolve the crystals in the mixture of acetic acid, isopropanol, and ethyl acetate (10-15 minutes with stirring) to prepare a concentrated solution. After it is fully dissolved prepare the working solution by adding the methyl-tert-butylether (MTBE) and petroleum ether. The use of 5-MTN for development of fingerprints is identical to the procedure for ordinary ninhydrin. The papers that need to be treated are dipped in the working solution and the solvents allowed to evaporate. This procedure should be done in a fume hood, to avoid breathing the fumes and the possible formation of an explosive solvent/air mixture in the room. For the treatment of paper, BVDA has a practical developing tray in the program. With this tray, small amounts of working solutions can be used, preventing unwanted evaporation to a minimum. After one to two days at room temperature, the development of the fingerprints is largely complete. The development will still proceed slowly after this period (for about two weeks, see references 7 and 8 for regular ninhydrin). Because the development of fingerprints stops after treatment with zinc chloride, it should not be done too soon. Wait at least two days, after treatment of the papers with 5-MTN working solution, before proceeding with zinc chloride treatment. Zinc chloride treatment of prints on paper, developed with 5-MTN, is a very simple procedure. BVDA has developed a zinc chloride solution, on a MTBE/petroleum ether basis. This contains a high concentration of zinc chloride (30 grams/liter), so that only small amounts are needed. It is possible to dip the paper in the zinc chloride solution. However, it has the potential to run inks and the concentration of zinc in the solution is higher than needed for dipping. We recommend that a sprayer should be used in a fume hood to apply the zinc chloride. Spray the solution on the article only lightly and allow the solvents to evaporate. For the formation of the fluorescing complex a small amount of water is needed. Usually, enough water is present in the air for this to happen. The complexation will normally take only a few minutes. Humidifying a print (by breathing on it) speeds up the process. Only if the color change is not complete, spray again. By spraying the paper with zinc chloride solution, accurate control over the dosing is obtained. Also running of ballpoint inks can be prevented best this way. Prints developed with regular ninhydrin can be made fluorescent by treating them with zinc chloride. However, it is an unreliable procedure that has shown sensitive to the conditions used for developing the prints and other unknown factors. 5-MTN is much more rugged in that respect. Even heating with a steam iron (not recommended) and subsequent treatment with zinc chloride will give good fluorescing prints (though the fluorescence is less than after proper development). On certain low quality papers (like newspapers, recycled paper, and corrugated cardboard) we found that 5-MTN will develop prints of good visibility, but low or no fluorescence. Treatment with zinc chloride will change the color of the developed prints (that initially have the same color as ninhydrin developed ones) only slightly (more pinkish). This in contrast to ninhydrin which changes from purple to orange. These orange prints show greater absorption (under blue green light) than the untreated print and will provide a little better contrast with weak prints. With 5-MTN we found no improvement of the light absorbing qualities after treatment with zinc chloride. Fingerprints developed with 5-MTN and treated with zinc chloride, will fluoresce under green light (optimum about 520 nm). These excitation and viewing conditions are similar to those for DFO developed prints. Optimum viewing and photographing is done with dark orange glasses/filters (cut on point 570-590 nm). With the use of cadmium salts (poisonous and environmental unfriendly) for the treatment of 5-MTN developed prints, less fluorescence is obtained than with the use of zinc chloride. Complexation with other metal salts (for example nickel and copper) yields non-fluorescent prints. For the treatment with zinc chloride, we developed the following non-CFC formulation. We have found it to be very reliable and stable (we have stored and used solutions that were several years old, without any problem). In Europe this solution can be obtained from BVDA International in the Netherlands. Dissolve 30 grams of zinc chloride in a mixture of 500 ml methyl-tert-butylether (MTBE) and 20 ml of anhydrous ethanol (98% or more) using a 1 liter erlenmeyer flask, a magnetic stirring bar, and a magnetic stirrer, in a fume hood. It will take about 30 to 60 minutes to dissolve completely. After it is fully dissolved, add 10 to 20 ml of glacial acetic acid (99-100%) and dilute with 500 ml of a hydrocarbon solvent (petroleum ether, pentane, heptane). Store in a brown glass bottle. The zinc chloride solution is particularly stable, also at low temperatures. In principle it can be kept indefinitely. 5-Methylthioninhydrin (5-MTN) was synthesized by Prof. Madeleine Joullié and her co-worker Dr. Robert Heffner of the University of Pennsylvania in the beginning of the nineties . 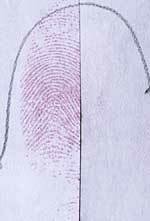 Tests by the US Secret Service (USSS)  and the Israel National Police  showed that 5-MTN can develop fingerprints with a color equivalent to (or stronger) than ninhydrin. After treatment with zinc chloride the developed prints were found to fluoresce stronger than those treated with DFO. The published syntheses [references 4 and 6] were not amenable to large scale synthesis, due to various reasons. This has been solved by BVDA. For a comprehensive overview on ninhydrin and ninhydrin analogues prior to 1991, see the chapter written by Dr. Joseph Almog in "Advances in Fingerprint Technology" . For more literature references, see the literature page on the website of the Center for Forensic Studies at Texas Tech University. Davies, P.J. ; Kobus, H.J. ; Taylor, M.R. ; Wainwright, K.P., "Synthesis and Structure of the Zinc(II) and Cadmium(II) Complexes Produced in the Photoluminescent Enhancement of Ninhydrin Developed Fingerprints Using Group 12 Metal Salts", Journal of Forensic Sciences, Vol. 40, No. 4, July 1995, p. 565-569. Petrovskaia, O.G., Ph. D. Thesis, University of Pennsylvania, 1999. In a not too large space this can be accomplished by placing a large tray with a brine solution. This solution is made by dissolving as much salt as possible in (tap) water, till no more salt dissolves. For example in a bottle, by shaking. To be certain that the solution is a saturated one, an excess of salt (sodium chloride) is used. The mixture of salt and brine can then be transferred to a tray. Heffner, R.J.; Joullié, M.M., "Synthetic Routes to Ninhydrins, Preparation of Ninhydrin, 5-Methoxyninhydrin, and 5-(Methylthio)ninhydrin", Synthetic Communications 1991, Vol. 21, No. 21, p. 2231-2256. Cantu, A.A.; Leben, D.A. ; Joullié, M.M. ; Heffner, R.J.; Hark, R.R., "A Comparative Examination of Several Amino Acid Reagents for Visualizing Amino Acid (Glycine) on Paper", Journal of Forensic Identification 1993, Vol. 43, No. 1, p. 44-66. Almog, J.; Hirshfeld, A; Frank, A.; Grant, H.; Harel, Z.; Ittah, Y., "5-Methylthio Ninhydrin and Related Compounds: A Novel Class of Fluorogenic Reagents", Journal of Forensic Sciences 1992, Vol. 37, No. 3, p. 688-694. Hewlett, D.F. ; Sears, V.G., "Replacements for CFC113 in the Ninhydrin Process, Part 1", Journal of Forensic Identification 1997, Vol. 47, No. 3, p. 287-299. Hewlett, D.F. ; Sears, V.G. ; Suzuki, S., "Replacements for CFC113 in the Ninhydrin Process, Part 2", Journal of Forensic Identification 1997, Vol. 47, No. 3, p. 300-306. For ordering and prices see this page. Copyright © 2019 BVDA America Inc.